This tutorial shows you how to simplify a map using mapshaper.org, to reduce the file size and thereby optimize it for the web. 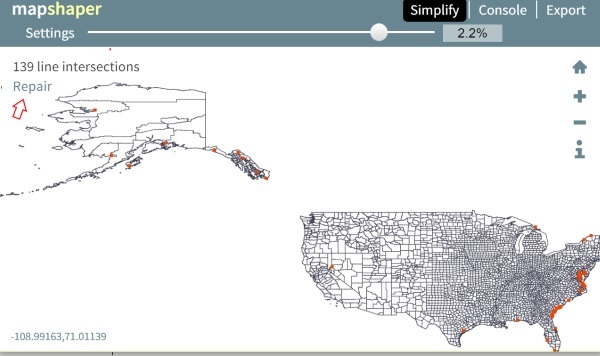 In mapping or dashboard applications such as StatPlanet, simplifying a map can greatly speed up the loading time. 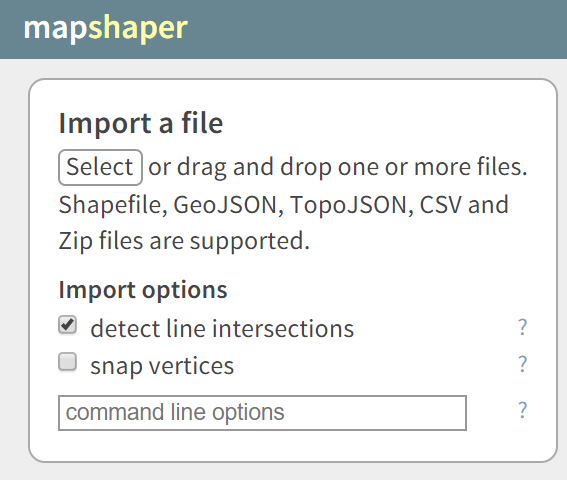 Mapshaper accepts several map formats, namely: shapefile, GeoJSON and TopoJSON. 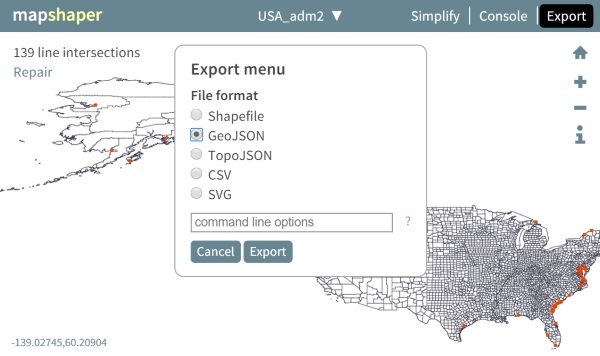 In this tutorial a shapefile map is simplified, but the procedure is similar for other map formats. Step 1. Open mapshaper.org, and click on select to attach your map files. Step 2. Your shapefile map consists of several files as shown in the example below. Select all the files (or at least the .dbf and .shp files, and if available, the .shx and .prj files). To select multiple files, hold the CTRL button while selecting the files. Step 3. The map should open as in the example below. 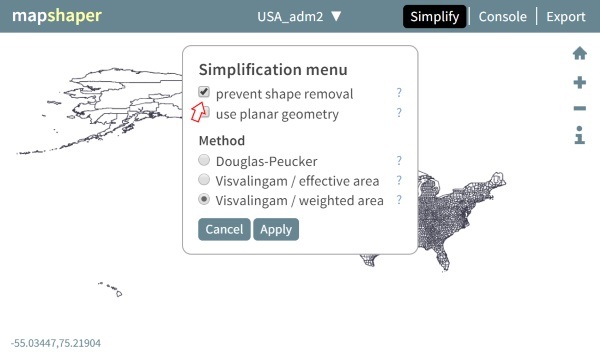 You can now export directly (see Step 5 below) or simplify the map by clicking on Simplify in the top-right menu. Make sure to select prevent shape removal as shown in the image below, otherwise map areas may disappear through the simplification process! Then, click on Apply. Step 4. Simplify the map by moving the slider to the right. The percentage simplification indicates how much the file size will be reduced. Make sure to also click on repair in the top-left corner if intersections are detected (caused by simplified adjacent geometric shapes). Usually mapshaper can fix them, but if not, you can just choose to leave them in. They will usually not be very visible, unless you zoom into the map. Step 5. Click on Export to save the map. Select the format you require, and then click on Export.